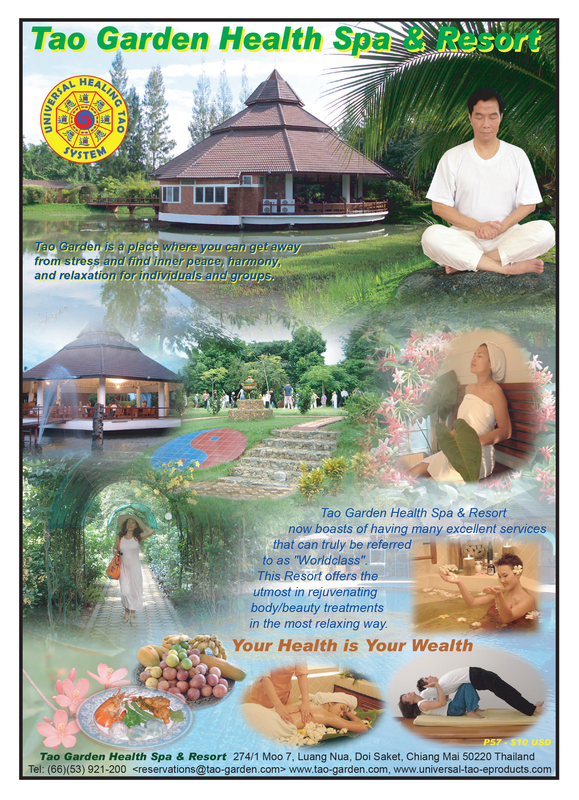 This poster illustrates Master Chia in the Meditative Posture with background pictures of the Tao Garden that included Arial View, Townhouses, Swimming Pool and Spa, Dining Hall and Immortal Meditation Hall. Tao Garden Health Spa & Resort is an internationally renowned healing center founded by Taoist Meditation Master Mantak Chia. Immersed in fifty acres of beautiful gardens with hundreds of bonsai in the foothills of the Himalayas, outside the hustle bustle of Chiang Mai, it is a unique health center offering physical, emotional and spiritual detox programs to live longer and healthier. The core of the healing experience at Tao Garden is you visiting the Pakua Integrative Health Clinic that specializes in offering an integrative approach to health. Our caring doctors and practitioners consider you as a whole being: mind, body and spirit. The clinic's holistic philosophy draws from the Taoist foundations as taught by Master Mantak Chia, encouraging you to draw on your own inner Source power to maintain true health. Our international team of health specialists uses the latest methods from Traditional Chinese Medicine, Ayurvedic Medicine, Energy Medicine and Allopathic Medicine to determine the root cause of dis-ease and to design a therapeutic program appropriate to your needs. Our new beautiful Tao Spa and the fitness center are also part of the Integrated Health Center. Enjoy your delicious, freshly prepared, organic meals in the tranquil atmosphere of the octagon-shaped Dining Hall, with its open sides overlooking a still-water pond. Help yourself to the variety of juices, teas and ionized water that are available all day. Our Joy of Juice Club has the ambience of a social club and the mission to provide delicious healthful juice blends designed to delight the palate, heal the body, and satisfy the soul which is Tao Garden's approach to your wellbeing. All the activities and treatments at Tao Garden Health Spa & Resort are based on the Seven Taoist Secrets of Longevity.